It’s always an inspiring experience when someone who has received help, in however big or small a way, is grateful and goes on and do greater things of his own. 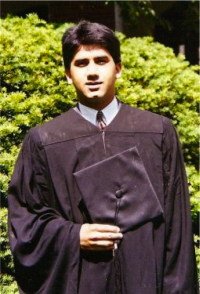 That’s why we wanted to share the story of ophthalmologist and fellow Yalie, Ravi Goel. When I was a medical student in the 1990s I applied for a Sigma Chi Foundation scholarship. I was that kid in college and medical school who applied for every bit of financial aid I could identify. Although I received scholarships in ’93 and ’94, after I was declined in ’95, I asked Keith Ferrazzi (Yale ’88) for a letter of recommendation. Keith was the founder and first president of Yale’s Sigma Chi chapter – well documented in his book Never Eat Alone – and we had met informally at a few of the alumni events on campus. Thanks in part to Keith’s generosity; I received general scholarships from the Sigma Chi Foundation in 1993, 1994, and 1996, for a total of $1,500. For many years, I promised myself that I would pay back the generosity that both the Sigma Chi Foundation and Keith showed me when I was a student. The cost of a medical education has become increasingly burdensome and I fear that a bright, aspiring “financial aid kid” like me might turn away from medicine because of its costs. I recently met with Sigma Chi Foundation development officer Jeffrey Rothenberg in the hopes of creating an endowed fund for Yale Sigma Chi brothers who then go to medical school. The scholarship will have a preference for Yale’s Theta Upsilon chapter brothers and will be opened to other Sigs if a suitable Yale graduate does not apply. I pulled out an initial check and signed the pledge. I will fully fund the endowment by the end of this year so that the initial award can be made in 2015. The Ravi D. Goel MD Medical Scholarship will help generations of Theta Upsilon Yalies and Sigma Chis as they pursue a career in medicine. His dream is that those supported by this scholarship will one day pay-it-forward to help others they may never meet. Thanks, Ravi, for leading with generosity and remembering to pay forward the kindness and generosity you received at Yale.